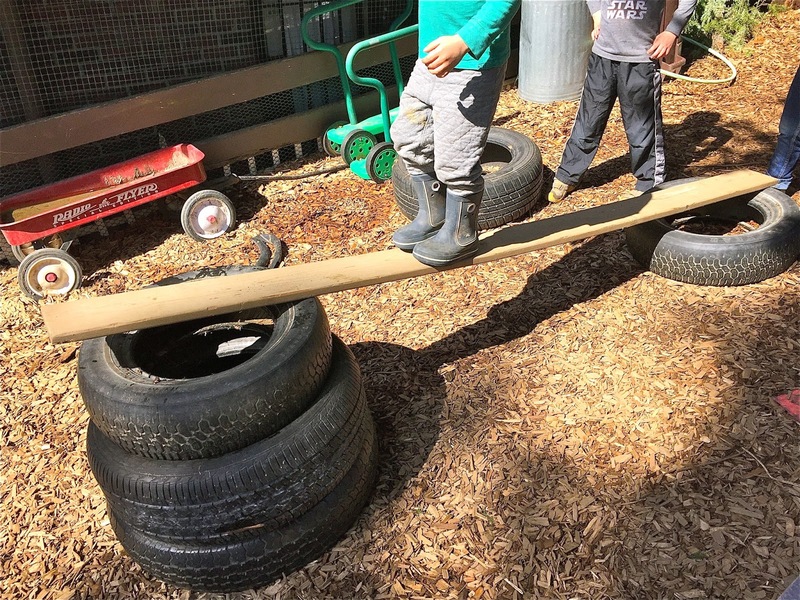 People often decide whether or not they want their kids to attend our school based upon their perceptions of the outdoor part of our classroom: either they dig on the junkyard chic or they don't. But even among those who think their kid will have fun playing here, there is a sizable portion who ask, "But where do the children climb?" It's a legitimate question, I suppose, because we don't have one of those standard issue climbers -- what we would have called a jungle gym when I was a boy. I point out that we do have our concrete slide, which is an unregulated two-way street and one of our lilacs makes a decent perch, but neither usually inspires parents who ask. No, they ask because their child has been climbing since he could walk, scaling anything and everything. They ask because their child has achieved the pinnacle of every climber within a five mile radius and they're looking for a new challenge. 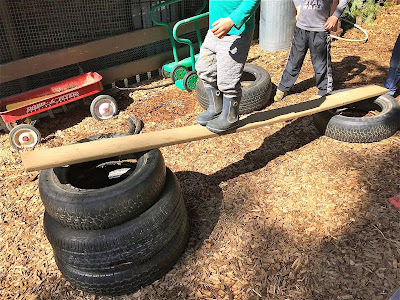 The thing that's hard to explain, the thing one must see to understand, is how the children of Woodland Park create their own climbing and balancing challenges, usually employing our loose parts to manufacture their own playground. Of course, they aren't just climbing, they're building, making a study of physics, of engineering, of cause and effect. These impromptu climbers often look hazardous to the adult eye, and occasionally they are, but most of the time, believe me, if the kids are planning to risk their own bodies on it, they're testing and re-testing every step of the way, then approaching with the sort of caution one rarely sees when they climb out-of-the-box climbers. One of my fundamental jobs is safety, so I'm always watching as their climbing experiments take place, sometimes stepping in with observations and opinions: "That part looks like it's about to fall off," or "I doubt that will hold you." 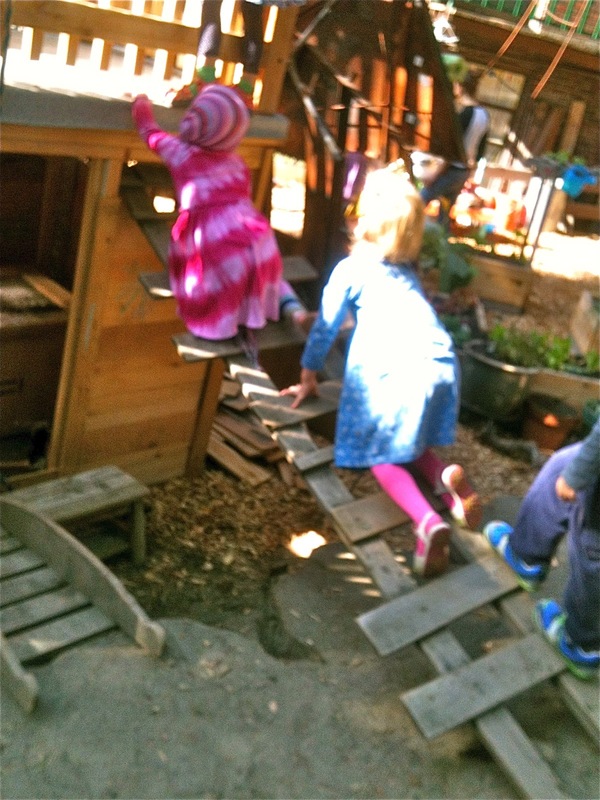 Most of what the children create, while challenging, isn't nearly as dangerous as typical playground climbers. Sure they're less stable, more fraught to failure, and often kinetic in a way that equipment manufactures tend to shy away (like when we build our climbers on the swing set), but they rarely achieve altitudes much higher than their heads, usually much lower. Every now and then someone will offer us a climber, "barely used," often quite nice, something from a backyard set up. We get offered those because the kids, as they will, have grown bored with the one-trick pony. We politely refuse because the kids will ultimately grow bored with it here at Woodland Park as well, and then we'll have to figure out who can take it off our hands. The kids never get bored of our climbers. When they've learned what they need to learn, they make a new one.